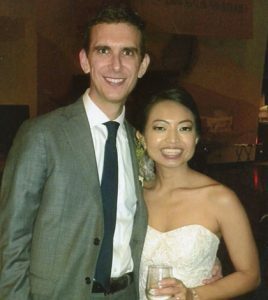 John Huetsch and Christina Lai were married Oct. 6, 2018, near their home in Baltimore, Md. The bride is the daughter of Anthony and Jessica Lai of Kennesaw, Ga. She is a graduate of Emory University with a bachelor’s degree in biology and a graduate of Johns Hopkins University with a bachelor’s degree in science and nursing. She also earned a master’s degree in business and science from Keck Graduate Institute. She is a nurse at Johns Hopkins Hospital. The bridegroom is the son of Jay and Mary Huetsch of Waterloo. He is a graduate of Harvard University with an undergraduate degree in biochemistry. The earned his doctorate in medicine from Washington University in St. Louis. He is a medical doctor and assistant professor at Johns Hopkins with a specialty in pulmonary research.